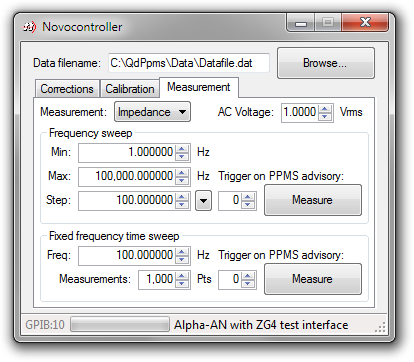 Our Novocontroller software package is designed to interface with the range of Alpha-A high-resolution dielectric, conductivity, impedance and gain-phase modular measurement systems available from Novocontrol Technologies to enable measurements of dielectric materials in the controlled temperature and magnetic field environment of the PPMS instrument. The software runs concurrently with the PPMS MultiVu application on the PPMS control PC and provides direct control of the Alpha-A analyzer. 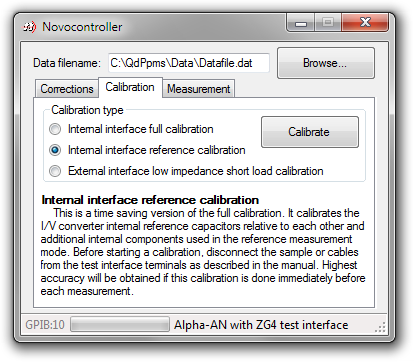 Measurements are set up in the Novocontroller (including appropriate calibrations) prior to initiation of a regular PPMS measurement sequence in MultiVu, which then triggers the Alpha-A measurement at appropriate points through a standard sequence command. 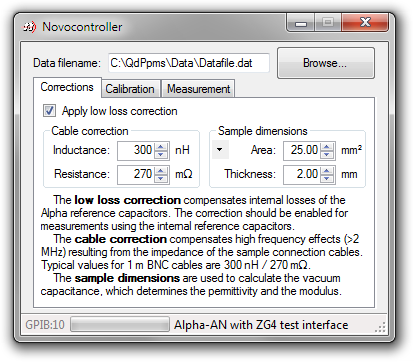 The software presently supports frequency and time domain impedance measurements, in particular using the ZG4 test interface. Other test interfaces may also work, but are not directly supported. However, the software is designed to be easily extensible to meet customer requirements in terms of additional measurement and interface types. The software is offered under licence, and a fully-functional evaluation copy is available upon agreement to the licensing terms.